Retired last week, YEAH! I have a 2018 Heartland Bighorn, 43.3 in length. I am concerned about my Bighorn having a rusted frame when all other RVs don’t. You are joining a good group of folks here with good info to share. Why not have the frame inspected by a certified RV inspector? There is a product called rust converter. It is a paint on product. Since this appears to be minimal surface rust, go buy yourself some and paint it on. Likely the frame was delivered in winter or sat outside for several weeks, and the thin coat of paint Lippert put in was not enough. Its a common situation and not that big of a deal. I would never have accepted the rusty frame! Wire brush and paint it. Frame rust is usually not a problem unless you have chunks flaking off. For such a new trailer, it must have been parked in grass or a damp ground spot for awhile. Try using a tarp or any barrier under the trailer if you need to long term park over grass or moist dirt. That only appears to be surface rust at the moment. The rust converter,as suggested, works well. Put it on then cover it with a spray on frame undercoater or bedliner type product. Looks like your rig was transported over wet salted roads then put in storage without rinsing the salt off. No big problem but deal with it before it does become a big problem. 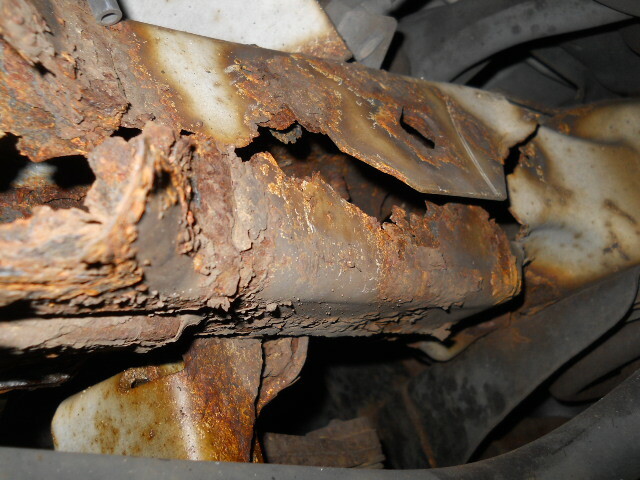 Like othes have said, you have surface rust, treat it with a rust encapsulate paint, and rest easy. If those pics are what exists, then no big deal at all. Just prep and paint and it will be fine. Me? I would take a few hours and sandblast and repaint. But that's mostly overkill and I have access to the equipment and it's a lot faster than sanding or wire wheeling. I question why it wasn’t painted when assembled like other RVs I see? I'm sure it was painted. I see black in there. Surface rust displaces paint. I am sure it was painted also, but the cost of quality paint has probably quadrupled in the last 10-12 years. The RV industry is not going to spend the money for a state of the art product. They are going to get by with as little outlay as they can. For others that have a new or newer RV that still has good paint, there is a product called fluid film that you can buy in auto parts stores. It is in an aerosol can and sprays in the consistency of honey. It helps to repel water and (salt) chemicals. It will keep the frame looking good for many years with a few applications. Chassis saver paint has a rust killer and is able to be a applied by brush or sprayer. I have been doing mine and I can tell you when you peel it off of your skin you will loose a couple of layers! I did the underside a year ago and it is not peeling, flaking, or rusting yet. We have run over 12k mi with some on salty roads so far. X2 on the Fluid Film. Works great to protect all metal surfaces. Get about 4 spray cans worth to do the frame and springs.